After a hard fought second moto at the MXGP of Bulgaria, Team Assomotor Honda’s Mathys Boisrame took the race victory, the overall and most importantly the title of 2018 EMX250 champion. Heading into the weekend with a lead of 18 points, Mathys extended that to 40 points after a comfortable second place finish in Saturday evening’s first race. This meant that he had to place 10 points ahead of his closest competitor in order to seal the championship before the final round in Assen. Pulling yet another holeshot on his Honda CRF250R helped him get off to the perfect start and as chaos reigned behind him, Mathys remained calm in the knowledge that he was doing everything he could to get the gold plate a round early. As the race drew on, pressure mounted as his lead came under threat but Mathys was resilient until the end, holding off the challenge and crossing the line to take his sixth moto win, his fifth overall and his first European 250 championship. 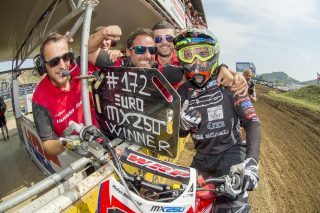 It was joyous moment for the young French rider who doesn’t come from a background of success, but who has gelled with the Honda CRF250R extremely well this year and together with a strong Assomotor team behind him and a family supporting throughout this rollercoaster campaign, he has grown into one of Europe’s top talents. He struggled at the opening round in Spain, scoring just eight points in the two motos, but at the second round in Portugal he catapulted himself back into title contention with a one-one performance. 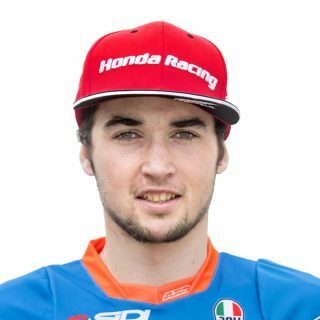 An average display in Russia was then followed by another overall victory in Latvia, and then another one a couple of rounds later at his home GP in France where he first got a hold of the red plate. 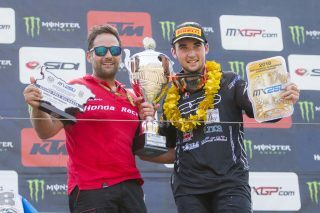 Unfortunately his results at the deep sand track of Lommel closed the championship points gap down to two, but overall victories at Switzerland and now Bulgaria meant that he got the 50 point differential he needed to win the EMX250 championship a round early, a round in which he can now run a fully deserved gold plate. 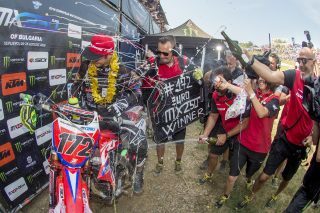 This is Honda’s second success in the EMX250 championship after Nick Kouwenberg won the title in 2015 and is further proof of the strength of the all-new 2018 Honda CRF250R. 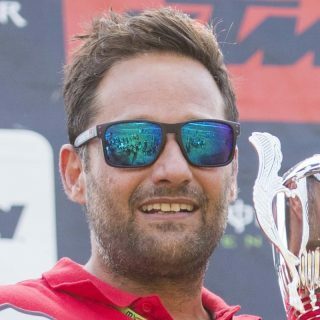 Mathys and Apico Factory Racing’s Steven Clarke have won more overalls than any other brand, pulled numerous holeshots and now also lead the manufacturers championship. Words cannot describe how I feel right now. 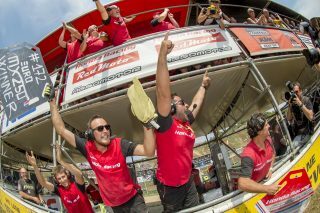 This early title win came by surprise: I knew we had what it takes to win the championship but we expected it to be decided in Assen, not here at Sevlievo. I am over the moon and so is the team, I think they deserve a good part of the credit because they have been super supportive all along. This is a massive achievement for all of us and for the new CRF250R, which proved to be a winning bike at the first try! I would also like to thank Honda and all the sponsors because nothing of this would have been possible without them. The season isn’t over yet: I will do my best to finish it on a high at Assen and then race the MX2 class again in Imola! Where do I start? I hardly know what to say, it hasn’t sunk in yet and I don’t know when it will happen! We’re so proud of Mathys, he’s our golden boy and today he has done what 24 hours ago we didn’t even know was possible to do here in Bulgaria. He showed an incredible amount of maturity in managing the pressure the way he did today, when he knew he had everything to lose. Now we’re standing on top of the EMX250 podium with the championship title in our hands, and we’re so happy. I want to thank everyone in the team, all the sponsors and Honda, who believed in us and gave us a championship-winning bike.